Playing Fields and Cancer—An Emerging Mass Tort? Oct. 27 — Amy Griffin was in her second decade of coaching college soccer when, in 2009, she met two goalies who had come down with lymphoma at the same time. Griffin, who coaches goalies at the University of Washington, thought it a strange coincidence. But it didn’t end there. Goalies spend a lot of time on the ground. “During a practice, they hit the ground more than 100 times easily and are covered in those black dots,” she said. “I remember sitting on a plane, surfing the web, looking at the components of field turf,” Griffin said. That took her to a list of carcinogens, including heavy metals, polycyclic aromatic hydrocarbons and volatile organic compounds. Griffin began compiling a list of athletes with cancer. It now totals 230, including 183 soccer players—of those, 114 are goalkeepers. The balance play field hockey, lacrosse or football. The EPA began looking at recycling scrap tires in the 1990s as a way to alleviate the problem of landfilling 240 million tires a year. By the early 2000s, crumb rubber was beginning to be used at playgrounds and playing fields around the country. 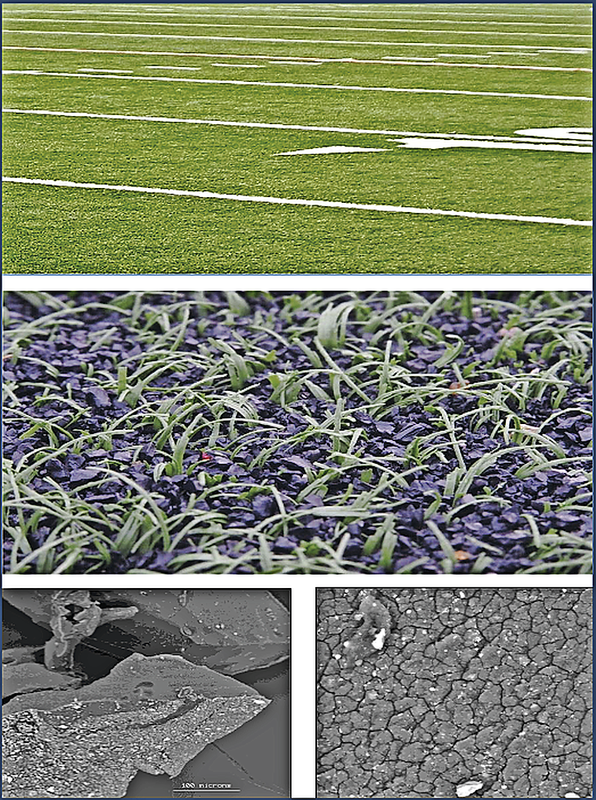 Approximately 11,000 fields and playgrounds in the U.S. contain crumb rubber today. Between 20,000 and 40,000 recycled tires are used to cover a football field. Now, seven years later, safety advocates and plaintiffs' attorneys on one side, and representatives of the artificial turf industry and defense attorneys on the other, await the results of what is expected to be the federal government's first comprehensive look at tire crumb's health risks. The inter-agency study—preliminary results of which are due at the end of the year—could very well generate some litigation tying the rubber fill on thousands of turf fields and school playgrounds to cancer. But no one, at least not yet, predicts a flood of new filings based on this single study. Unless, that is, the results paint a much more troubling picture of tire crumb's health risks than expected and some hard-hitting plaintiffs' attorneys decide to run with it. “At this point, we see indicia, which we always see before there’s adequate proof of causation,” plaintiff's attorney Ted Tredennick with Daniels & Tredennick in Houston told Bloomberg BNA. Tredennick, whose firm's speciality areas include defective medical devices, pharmaceuticals and environmental litigation, adds that it's likely only a matter of time before the data establishing enough of a link to proceed en mass with litigation comes in. An attorney with one of the country's most well-known plaintiffs' firms, Lieff Cabraser Heimann & Bernstein in San Francisco, is also keeping his eyes on the science. “I looked into a crumb rubber case a few years back and recommended against us taking it,” Don Arbitblit told Bloomberg BNA. “If the government comes up with new data or new information making it more viable, we’d consider it,” he said. New causation-related data going their way is exactly what safety advocates, and plaintiffs' attorneys, need most. In 2009, the same year Griffin started looking into cancer rates among goalies and other athletes, the findings of several related studies on tire crumb were reported, including one conducted by the Environmental Protection Agency. That same year, the California Environmental Protection Agency found a negligible human health risk from inhaling the air above synthetic turf, and the New York State Department of Health found no significant health concerns at synthetic fields. Those reports were followed, in 2010, by a study conducted by the Connecticut Department of Environmental Health that found “no elevated health risks” from crumb rubber. The Synthetic Turf Council, the industry voice for artificial turf, points to those state studies, and a finding of Dr. Archie Bleyer, former chair of the Children’s Cancer Group, that synthetic turf doesn’t cause cancer. But a more recent study, this one commissioned by Environment and Human Health Inc., a public policy group in North Haven, Conn., questions that conclusion. EHHI, which began looking into crumb rubber in 2007 in response to inquiries about health concerns, commissioned a study by Gaboury Benoit, a professor of environmental chemistry and engineering at Yale University in New Haven. The results of the Yale study, posted on EHHI's website in July 2015, didn’t address exposure pathways. But it found metals including cadmium and zinc and probable carcinogens including 2-mercaptobenzothiazole; 9,10-dimethylanthracene; Bis(2-ethylhexyl) phthalate; Fluoranthene; Heptadecane; Phenol, 4-(1,1,3,3-tetramethylbutyl); Phenanthrene; Phthalimide; Tetratriacontane and Pyrene. Soon after the Yale study came out, pressure grew on the federal government to look harder at tire crumb. In November 2015, Senators Bill Nelson (D. Fla) and Richard Blumenthal (D. Conn.), citing Griffin's list of 230 athletes with cancer, asked Elliot Kaye, chairman of the Consumer Product Safety Commission, to lead an independent investigation into the material's health effects. The CPSC, earlier in 2015, had already pledged to assist California’s Office of Environmental Health Hazard Assessment in conducting a new evaluation of crumb rubber’s impact on human health. Then, in January of this year, the two senators wrote to President Obama, requesting a comprehensive federal study to include not only CPSC, but also the EPA and the Centers for Disease Control and Prevention. The following month, the agencies launched the currently underway joint study. “Current information from a number of studies does not show an elevated health risk from playing on fields with tire crumb. However, these studies do not comprehensively address the concerns about the potential health risks associated with exposure to tire crumb,” the EPA said in a statement posted on its website about why it was conducting the research. The agencies are scheduled to release, by the end of 2016, a status report with the summary of its findings. “While this effort won't provide all the answers, the information will help answer some of the key questions that have been raised about tire crumb used in artificial turf fields,” the EPA said. It also “will provide a better understanding of potential exposures that people may experience by using these fields,” and help determine whether more research is warranted. Nancy Alderman, the Environment and Human Health Inc.'s president, told Bloomberg BNA that “Griffin’s statistics and data helped to move the issue” of whether tire crumb causes cancer forward. But, whatever the results of the interagency study, no one, including Griffin, seems to think it will resolve the issue. What’s more, the preliminary interagency report won’t include a risk assessment, Mike Peterson, a scientific adviser for the Recycled Rubber Council told Bloomberg BNA. The RRC advocates for the beneficial use of reused rubber. “It will look at chemical concentration data. I assume risk assessment will be done later,” said Peterson, who is also a senior toxicologist at environmental and risk sciences consulting firm Gradient Corp. in Cambridge, Mass. In addition, he said, the agencies aren’t comparing levels of toxic substances in crumb rubber to soil composition, or considering background rates. “Coach Griffin’s list is thrown around a lot without much context. There’s nothing about background rate of cancer,” he said. “If you look at the youth soccer population over the last 15 years, you’d expect 21,000 cases of cancer,” Peterson said. Peterson added that the studies that have raised concerns about tire crumb, including the Yale study, have not done a risk assessment and have not been peer-reviewed. “The peer-reviewed studies have found that the toxic substances are below levels of concern,” he said. As safety advocates and industry representatives wait for the government's new findings, one plaintiffs' attorney says it is likely a matter of when, not if, the litigation will take off. Part of the problem with proving causation currently, according to Tredennick, is that tire crumb has only been used as filler in playing fields and playgrounds over the last 15 years or so. Consequently, enough statistical evidence might not yet exist to build solid cases. “These fields are relatively new. It’s been less than two decades and the number of people exposed is going up. The statistical pool has to get to the point where we can do statistical analysis,” he said. In addition to establishing enough of a causative link to proceed in court, plaintiffs' attorneys must consider other problems such as individual exposure levels and the source of those exposures. Arbitbit, with Lieff Cabraser, said crumb rubber is not a single substance from a single company. Tires are made by multiple companies in multiple countries and contain “different type of toxics from one to another,” he said. “If I have a child who gets sick, I have to know who I’m filing against. How do I know who made the particular crumb rubber she was exposed to?,” he said. “Also, proof of exposure is itself a tall order. It can be inhaled, or there can be dermal exposure,” he said, and it can be difficult recreating the exposure amount. For now, plaintiffs' attorneys hope they get more research, like the Yale study and what they hope the federal government will find, going their way. “Our feeling is that the turf industry is defending like the tobacco industry defended the causal link to cancer. They tried to create a specter of doubt about the science and research,” Tredennick said. “We’ll know more as the federal agencies release their research,” he said. Defense attorney William Anderson with Crowell & Moring LLP in Washington says the interagency report is unlikely to be a bombshell. Anderson’s practice includes product liability, toxic tort, and environmental matters. He also tracks the science in several current product and tort controversies, including those over crumb rubber, diesel exhaust, and formaldehyde. “I expect the outcome of the report will not be dramatic. But it may be enough ammunition to generate litigation,” he said. But he doesn't give plaintiffs' attorneys very good odds. “There’s an army of information that seems to contradict,” any link between cancer and tire crumb, and it would be an uphill battle for plaintiffs’ experts to establish causation, he said. Anderson estimates that, despite the end of the year deadline for early-round findings, it will be at least two to three years before the federal agencies put out their final findings. That's also around the time when California regulators, with the help of CPSC, are slated to release their report.